Scan from original glass negative. Lisa and Dominic – I’m so sorry, I just now saw your messages. Of course you may copy the photo as long as the information I provided is attached. The negative for the image was part of a large collection of images made by Arthur FitzGerald Cochrane that was given to me years ago. John Rochon, Sarnia, ON Canada. My name is Lisa (McGreal) Harrison and through research, I know that we are related! I’ve been diving into our family history and would love to share the findings of our legacy. My great-great grandfather is Michael (son and grandson both James J. McGreal). I live outside Chicago. John Rochon, if this photo does indeed belong to you, may I, too, share? We are having a family reunion next month and this will be such a great addition. Thank you! This is Dominic McGreal, formerly of Thallabawn and now lives in Dublin. I was doing the researched the history of The Killary Lodge Farm. 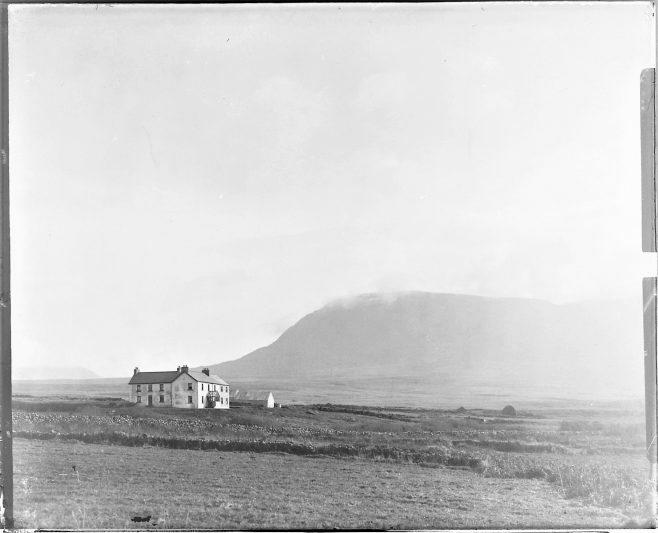 My great- great grandfather Dominick Mc Greal and his son Michael McGreal worked the herdsman at the Killary Lodge farm. I wonder the photo of The Killary Lodge house is belong to you? I would like to ask your permission for the copy of the photo?